Eating biscotti always reminds me of our old neighbors (Hi Greg, Kari, Kim and Tom!!!). I don’t even think we ever ate biscotti when we lived next door to them. However, there was one visit they came out to see us and I bought a big tub of Biscotti from Costco and I think we ate nearly the entire tub. Ever since, we always have biscotti for each other when we visit! Back to the biscotti. I have so many flavor combinations in my head, just like donuts, but I knew this would be one of the first ones I wanted to try. After making the pumpkin spiced biscotti this fall, it was time to tackle this holiday version. And I’m so glad I did. It tasted wonderful. Yes, past tense. It’s gone now. Must make more soon. What are you baking up this holiday season? ** If you haven’t done so, come join me on Twitter! Get the scoop on what’s in my kitchen before everyone else! And what another great way to get to know each other too! Click here to join me! In mixer, beat sugar, hot water, eggs, instant coffee and peppermint extract together until smooth and creamy. Slowly add in 2 cup flour, 3/4 cup cocoa, baking soda and salt. Batter will be very sticky. Line two cookie sheets with silpat or parchment paper. In small bowl mix 2 Tbsp of cocoa powder with 2Tbsp flour. Divide dough in half and sprinkle parchment with flour/cocoa mixture. With hands, press dough into two rectangles, about 4 in by 10 in (and 1/4 inch high). Bake in a 350 degree oven for about 15-20 minutes. Remove and let cool 10-15 minutes. Slice rectangles into 1/2inch to 3/4 inch wide slices. Lay each slice on it’s side and put back in the oven (on the parchment lined baking sheet) for an additional 15 minutes. Remove from oven and allow to cool completely on wire rack. Melt white chocolate morsels according to package directions, Spread bottoms of each biscotti with white chocolate then dip into the crushed candy canes. Allow to set, about one hour. Makes about 18 large biscotti. Enjoy! Looks fabulous and nice and crunchy! I would love dipping this biscotti in hot chocolate! It would be sublime! Love it! Love your whole blog. I am such a big fan of sugary sweets. 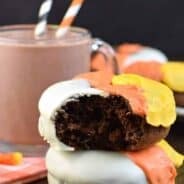 Becoming a follower to keep up on all your sweet creations! If you get a chance sometime, you’ll have to stop by my blog. I love biscotti and this sounds like a winning flavor combination. I’m pinning it so I don’t forget about it…I’ll be making it soon! You read my mind! 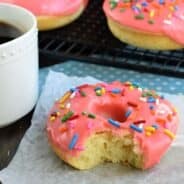 I was planning on making a recipe like this, this weekend, now I’ll use yours! I just love candy cane foods! Last night I made Candy Cane Mousse! Yum! Thanks for the recipe, I can’t wait to try it! Definitely making these for Christmas. 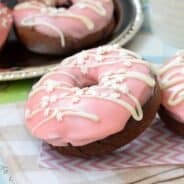 Your pictures look fabulous and what a great recipe. I’m a BIG peppermint fan! I am now following you and would love a follow back. I love biscotti and this looks especially delicious. Can’t wait to try it! They look delicious! 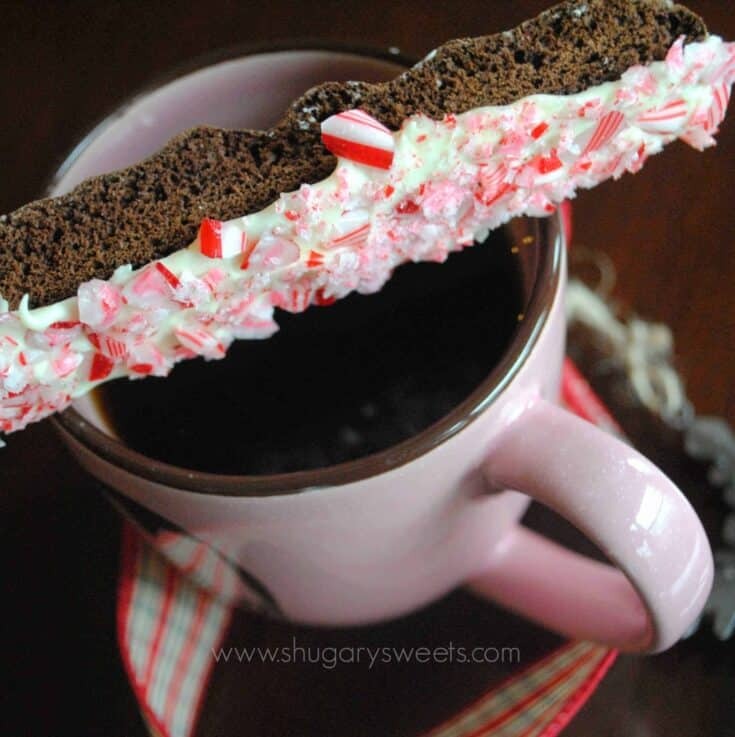 I have bags of candy canes that I need to use up so I might give this recipe a try. Thanks for the other links too! Yummy! I am going to have to try this recipe ASAP! I linked at Melt in Your Mouth Monday too – that’s where I saw you. I link Peppermint Brownie Bites. Peppermint is in the air! Love your blog! I am SO adding this to my baking list- and pinning it!! Saw these over on Today’s Creative Blog and clicked over! They sound perfect for the holiday season, and quite frankly I’m always looking for a good excuse to eat something peppermint! I’m an avid baker…I’ve attempted to make these twice and both times they have burnt to a crisp. First time I followed directions to a tee. Second time, I reduced cooking time, lowered oven temperature and moved the rack up higher to no avail. The first time they burnt after being cut into pieces, the second time they burnt on their first visit into the oven. So discouraged. Thanks anyways, but I won’t be attempting these again.